But they weren’t inside women’s religious orders, were they? After the invasion and occupation begins in 1759, they are! General James Murray, the occupation governor, surveyed the institutional buildings in the city and saw the advantages of setting up his temporary base of operations inside the Ursuline convent! But here’s the funny part: you’d never know it from the Ursuline records. Thus, the case of the missing men–and their missing trousers! (I know, 1759 is still squarely in the knee breeches era, with modern trousers being at least 50 years in the future for most men. But you’ll see a mention of “trowsers” in the primary source quoted below). Little did the Ursulines know that their service among hospital nuns during the siege would continue to be useful during the occupation of Québec as well. When they “hurried to return” to their monastery a week later on September 21, “we entered joyfully,” finding that for the most part, the convent had survived the siege. However, their chapel was damaged, and like the rest of the city, they were low on food and fuel, and winter was fast approaching. In a meeting with the newly appointed governor general of Québec, James Murray, the Ursulines learned that he would install a hospital in part of their monastery and quarter healthy soldiers there as well, considering the large and relatively intact spaces they possessed. The occupation of their convent was fortunate for the Ursulines, as “Monsieur Murai our illustrious Governor had the kindness to rebuild our Church, and all of our monastery. They started with the Church, which [was] the only one that was able to serve the Parish, and which serve[d] in this capacity since 24 September 1759.” Aside from helping out with building repairs, the Ursulines found that their new role as military contractors and their connections with British command meant assistance with supplies for the winter—soldiers procured fuel for them and shoveled their walks and workspaces, and King George paid to feed everyone in the convent—officers, soldiers, patients, and Ursulines alike: “Our conquerers knew of our indigence and assissted us with a kindness that we hadn’t had reason to hope for.” They were fortunate in that General Murray saw the value of the spaces and the social services offered by Québec’s religious women. He understood the esteem in which they were held by the rest of the city, and their potential value in pacifying its conquered citizens. In spite of the efforts of the Ursulines and British military leadership to procure better food and clothing for the soldiers, the winter of 1759–60 was astonishingly hard on them as well as on the people of Québec. The cold was a severe and persistent challenge to the British army camping in a war-ravaged Canadian city at the end of the Little Ice Age. Lt. Fraser complained in December of 1759 that “several” of his men “have already lost the use of their fingers and toes by the incredible severity of the frost,” and “some men on sentry have been deprived of speech and sensation in a few minutes, but hitherto, no person has lost his life.” That would change by the spring of 1760, when Lt. Fraser reported that nearly half of all men at the garrison in Québec were either sick or dead. Of the 5,653 men stationed in Québec, only 3,341 were fit for duty in the spring; 2,312 were sick, and nearly 700 had died since their triumphal march into the city on September 18. In an echo from Esther’s childhood in a war fifty years earlier, Fraser writes in the spring of 1760 that “the Scurvy, occasioned by salt provisions and cold, has begun to make fierce havock in the garrison, and it becomes every day more general. In short, I believe there is scarce a man of the Army entirely free from it.” Thus the Ursuline experience of young military men’s bodies over this winter was at least as much about their vulnerability to cold and disease as of their powers to intimidate and coerce. The Ursulines left almost no trace of these men in their convent records, as though one means of restoring the cloister and observing the Rule was to refuse to discuss in any detail the ways in which they cared for the occupying army. This omission is startling, even given the tendency of religious orders to deny or paper over conflict and to promote a vision of community peace and harmony. Aside from the picturesque and motherly detail about knitting stockings for the Highlanders, the men who lived and were nursed in the Ursuline convent in the winter of 1759–60 do not exist in the convent’s Annales, or in any other record. Were the Highlanders and their fellow inmates brutes, or angels? Did the Ursulines see the men as fellow sufferers, or helpful workers who fetched wood and helped with building repairs? Or were they only impositions on their sisterly communion, and even a danger to their young students? Any other miseries suffered or kindnesses received either were recorded in British officers’ journals of the occupation or are lost to history. 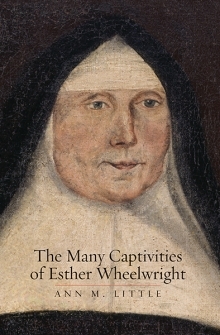 —The Many Captivities of Esther Wheelwright, 192-95. It’s not very often that women get to make the historical record and write men out of them, if the choose to. It’s hard to interpret this apparently strategic silence. Was there a history of violence and predation inside the convent that the nuns were eager to forget, or to paper over with memories of motherly kindnesses? Or were these men just somewhat more intrusive than those they had been dealing with all along–bishops, governors, confessors, fellow missionaries like the Jesuits, or even their own fathers and brothers–another group of men to avoid and work around as much as they could? Here too, the reputation for convents as spaces run by noblewomen also probably protected them and their students from assault. British officers like Murray–himself a minor noble, but like so many younger sons, left to make his fortune in the military–were doubtlessly more vigilant in looking out for the safety of women of their own class. Contrary to popular belief, Scotsmen did traditionally wear something beneath their kilts – trowsers. They were akin to long johns and useful for protecting against the cold. The new style uniform above maybe didn’t utilise them? 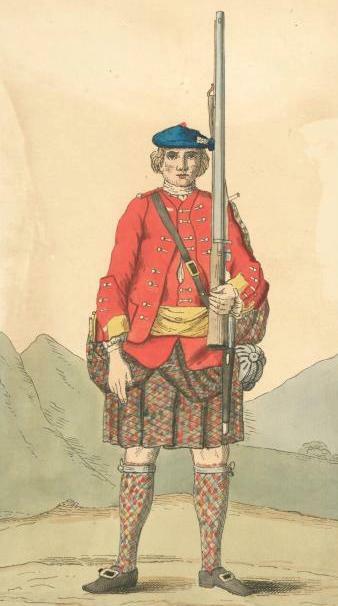 Later highland uniforms had long breeches as an alternative to kilts known as trews. Maybe they were an adaptation revived to cope with their new Canadian territories! Thanks for the tip. The men were clearly unequipped to cope their first winter. Good stuff here… That map is almost delicious enough to nibble on, but I just printed it out. You would almost think that Faden used a drone. Are his papers anywhere? His maps are everywhere, but he’s reduced to a brand, not a man. I’ve always thought that “insupportable” was an interesting rhetorical acknowledgment of vulnerability, often voiced by people who are supposed to be immune to all that. I’m going to spend much of the next week reading well over 100 accounts of how some of this material played in the imaginations of mostly-suburban Angleterrian teenagers. If General Forbes had moved any slower in 1758 (although he was hobbled mostly by politicians, Quakers, and discordant strategists), this place might be on the edge of, if not actually in, Quebec, the province. Maybe we would have had an Ursuline establishment of our own.